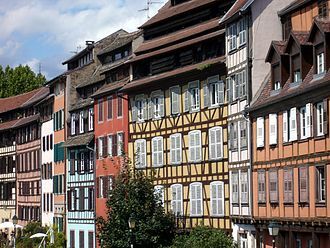 The High Rhine is the name used in Germany for the part of the Rhine River that flows westbound from Lake Constance to Basel. The High Rhine begins at the out flow of the Rhine from the Untersee in Stein am Rhein, in contrast to the Alpine Rhine and Upper Rhine, the High Rhine flows mostly to the west. 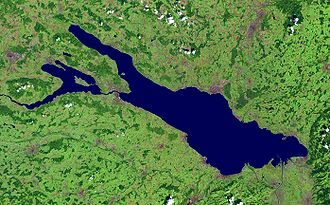 The section is marked by Rhine-kilometers 0 to 165, measurements beginning at the outflow of the Obersee at the Old Rhine Bridge in Constance and it is the first of four sections of the Rhine between Lake Constance and the North Sea. 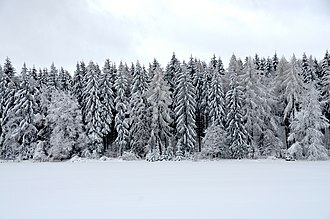 In Switzerland, similar names refer to different parts, in the western part, the Rhine marks the border between Germany and Switzerland, while in the eastern part, Switzerland owns areas north of the Rhine, surrounding the German exclave of Büsingen. The term High Rhine was introduced by scientists in the 19th century, above all geologists tried to differentiate the High Rhine linguistically from the Upper Rhine. Until the 19th century, it was known as the Badisch-Swiss Rhine. 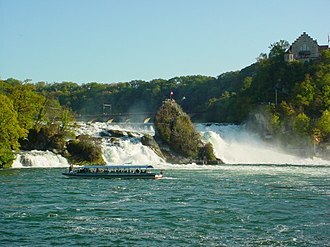 The Rhine Falls, which are the largest plain waterfalls of Europe, are in the municipalities of Neuhausen am Rheinfall and Laufen-Uhwiesen and they are 150 metres wide and 23 metres high. In the winter months, the water flow is 250 cubic metres per second, while in the summer. In Neuhausen am Rheinfall, the falls into a previously buried stream channel. 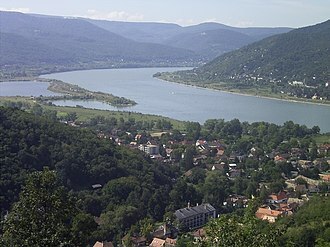 The next rapids are the Kadelburg Rapids at Koblenz, near Laufenburg, the post-glacial Rhine failed to find the old silted-up channel and hit a spur of Black Forest crystal. The river cut itself a gorge, containing the Laufenburg Rapids, the Laufenburg and Schwörstadt Rapids have been artificially eliminated by blowing up the rocks and raising the water level with dams. The character of the river has changed over long distances by the construction of hydropower station. 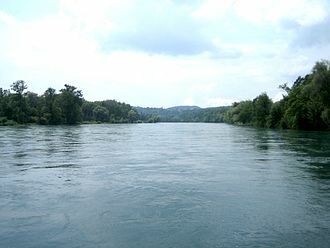 The Laufenburg and Schwörstadt Rapids were removed by blowing up rocks, originally to improve navigation, between Diessenhofen and Stein am Rhein, the High Rhine has yet to be dammed. The Danube is conventionally taken to be formed by the confluence of the two streams Brigach and Breg just east of Donaueschingen. Known as the source of the Danube is the source of the Donaubach in Donaueschingen itself, the source of the Danube is the source of the Breg as the larger of the two formative streams, which rises near Furtwangen. Thus, in 1981 the state government granted Donaueschingen the request that the source in Furtwangen should no longer be labelled Donauquelle in official maps, the history of the dispute was documented by Claudio Magris in his Danubio. The waters of rivers collect in a barely comprehensible number of headwaters, the numerous merger points of each greater upstream river build the backbone of this type of drainage system and with that the source of the entire river. The main point or backbone of a river is defined by further features such as length. For a long time, unique springs which differed in size or the point of a certain headwater had a mythological meaning. This was reflected in holy springs/ water sanctuaries or in the worship of Naiads and this was the case with the source of the mightiest river in the Roman Empire. 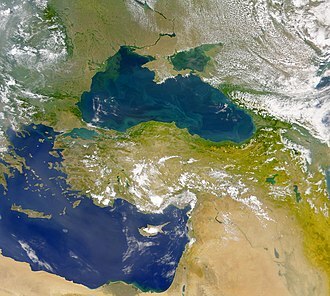 The Danube river emanating from the Abnoba mountains was considered to be a river or spring goddess, in contrast to the more mythological role, the hydrological significance of the source of the Danube is uncommonly small. This is because the Danube gives an important part of its water to the Rhine both above and below Tuttlingen, as a consequence, it dries up most time of the year. Near Ulm, in terms of hydrology, the Danube gets a tributary to the Iller which is more water-rich and it even gets surpassed by the Inn. The Donaubach rises on the grounds near the left corner of the front face of the castle Donaueschingen in a karst spring. This karst spring has an embankment of 15 to 70 l/s, the Brigach and the Breg become the Danube after 1.5 km. The source is one of 22 sources in the area of the junction of Brigach, all of these sources are fed by both water which trickles away above them and rainfall which trickles away on the karstified downs of a landscape called Baar. Swabia is a cultural and linguistic region in southwestern Germany. This territory would include all of the Alemannic German area, but the concept of Swabia is more restricted. 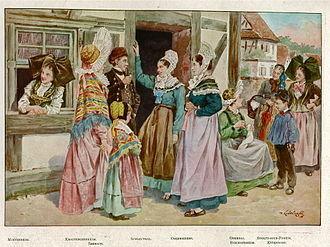 Swabians are the natives of Swabia and speakers of Swabian German and their number was estimated at close to 0.8 million by SIL Ethnologue as of 2006, compared to a total population of 7.5 million in the regions of Tübingen and Bavarian Swabia. Like many cultural regions of Europe, Swabias borders are not clearly defined, like all of Southern Germany, Swabia was part of the La Tène culture, and as such has a Celtic substrate. 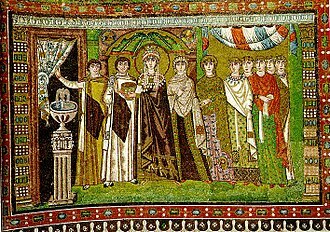 In the Roman era, it was part of the Raetia province, in the third century, it was gradually settled by the Elbe Germanic Suebi and other components that came to make up the Alemanni. The Alemanni were ruled by independent kings throughout the fourth and fifth centuries, Swabia became a duchy under the Frankish Empire in 496, following the Battle of Tolbiac. Swabia was one of the stem duchies of East Francia. Due to the foundation of the important abbeys of St. Gallen and Reichenau, in the following years the original duchy gradually broke up into many smaller units. 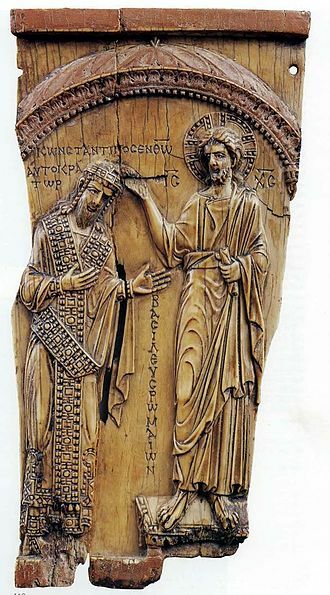 Rudolf I of Habsburg, elected in 1273 as emperor, tried to restore the duchy, but met the opposition of the higher nobility who aimed to limit the power of the emperor. 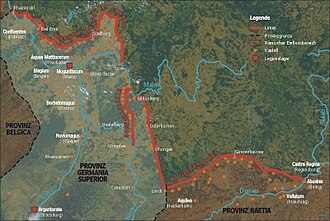 The rural regions were merged into the Reichslandvogtei of Swabia, which was given as Imperial Pawn to Duke Leopold III of Austria in 1379 and again to Sigismund and he took the title of a Prince of Swabia and integrated the Landvogtei of Swabia in the realm of Further Austria. Charlemagnes family is known to have hailed from Swabia, the major dynasties that arose out of the region were the Habsburgs and the Hohenzollerns, who rose to prominence in Northern Germany. 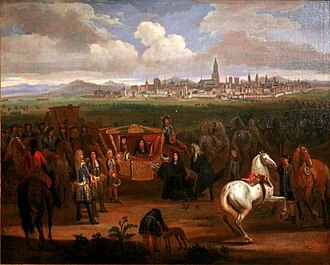 Also stemming from Swabia are the dynasties of the dukes of Württemberg. 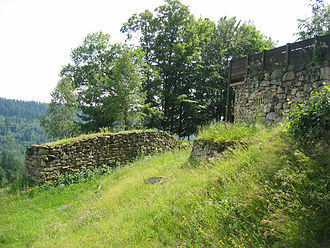 The Welf family went on to rule in Bavaria and Hanover, smaller feudal dynasties eventually disappeared, for example, branches of the Montforts and Hohenems lived until modern times, and the Fürstenberg survive still. The Carolingians had dissolved the original tribal duchies of the Frankish Empire in the 8th century. As the Carolingian Empire declined in the late 9th century, the old tribal areas assumed new identities as the subdivisions of the realm and these are the five stem duchies, Franconia, Lotharingia and Swabia. The term Stammesherzogtum as used in German historiography dates to the mid-19th century, the terms applicability, and the nature of the stem duchies in medieval Germany consequently have a long history of controversy. The overly literal or etymologizing English translation stem duchy was coined in the early 20th century, while authors tend to clarify the term by using the alternative translation tribal, use of the term stem duchies has become conventional. 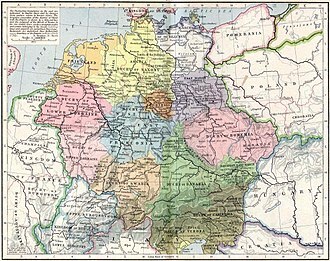 The derivation of the German people from a number of German tribes developed in 18th to 19th century German historiography and ethnography and this concept of German stems relates to the early and high medieval period and is to be distinguished from the more generic Germanic tribes of Late Antiquity. 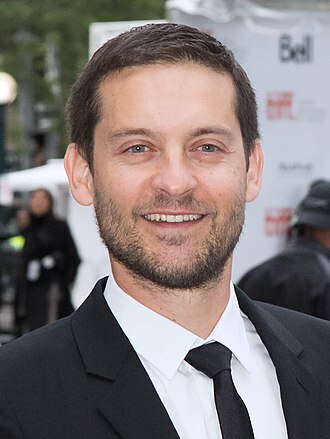 A distinction was made between the ancient stems, which were in existence in the 10th century, and recent stems. The delineation of the two concepts is necessarily vague, and as a result the concept has a history of political, the terms Stamm, Nation or Volk variously used in modern German historiography reflect the Middle Latin gens, natio or populus of the medieval source material. Traditional German historiography counts six Altstämme or ancient stems, viz. Bavarians, Franks, all of these were incorporated in the Carolingian Empire by the late 8th century. The customary or tribal laws of these groups were recorded in the medieval period. 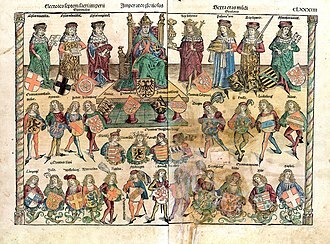 Franconian and Swabian law remained in force and competed with imperial law well into the 13th century, the use of Stämme, rather than Völker nations, emerged in the early 19th century in the context of the project of German unification. Karl Friedrich Eichhorn in 1808 still used Deutsche Völker German nations, Friedrich Christoph Dahlmann in 1815 asked for unity of the German nation in its tribes. This terminology became standard and is reflected in the preamble of the Weimar constitution of 1919, reading Das deutsche Volk, einig in seinen Stämmen The German nation, united in its tribes. 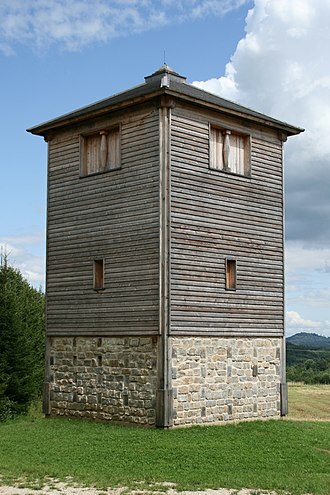 The Large Ofnet, one of the earliest sites with evidence of human habitation in the Nördlingen area.